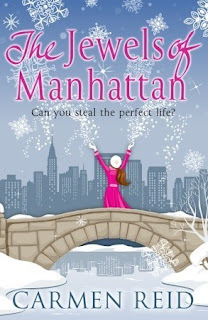 Carmen Reid’s latest novel, "The Jewels of Manhattan," had me intrigued from the moment it arrived on my doorstep, arriving in its very own ‘SWAG’ bag which was full of twinkly jewels! Add to this an exciting synopsis for this book that goes along with a very appealing cover and it simply didn’t matter that I’d never read any of Carmen’s popular "Annie Valentine" series beforehand, I couldn’t wait to start this book. Like all crazy plans, it was plotted out on a cocktail napkin. Brilliant and oh so simple... when you're a few Cosmopolitans down. Not quite so easy... if you've never stolen anything before, and you're dating a detective. The three Jewel sisters, Amber, Sapphire and Em, came to New York in search of the perfect life. But do they have to steal their dream? Or can they resist the temptation? A gorgeous, glittering, romantic tale for anyone who has ever dreamed of more sparkle. I don’t read crime novels, I don’t watch crime programmes on television, so my only hesitation when starting this novel was "would it be too focused on the crime for me to fully enjoy it? Would I like the characters?" I needn’t have worried. What the synopsis doesn’t tell you is that it’s one sister (Em) who instigates the crime, not all three, but inevitably they all become involved in some shape or form with the subsequent events. The characters were likeable and there is enough time dedicated to building up to the ‘event’ to make what happens plausible. The day of the robbery is when the plot of the book really kicks in; I really found it hard to put down. It was exciting, fast-paced and you didn’t know where the story would go next. Would the sisters end up on the run for the rest of their lives? I really enjoyed this book being about sisters, all very different, but similar in many ways. I was definitely rooting for their freedom! There are some key supporting characters and love-interests who are nicely tied in with the basic plot which makes this a real chick-lit novel with a twist, it’s definitely not just about a robbery and it remains a light fun read throughout. The sisters are all in their twenties and being in my thirties I found it refreshing to read a novel that covers characters who are less focused on settling down and more laid-back about life than found in some other novels. This was definitely an escapist read. I’ve come across other reviews which say Carmen (who is Scottish) tries too hard to make her characters sound American in this book which results in a lot of clichés. This wasn’t something I came away thinking, but then again I’m British so maybe I wouldn’t notice it as much. Overall, I really enjoyed this book and it’s a real page turner. I liked the fact that it offered something different to the ‘chick lit’ market but remains very much true to this genre and retains the balance needed for the target audience. I would definitely pick up any further books written involving the Jewel sisters.